Ukranian prankster moons Eurovision in Aussie flag. Ukrainian prankster Vitalii Sediuk moons Eurovision wearing Australian flag. 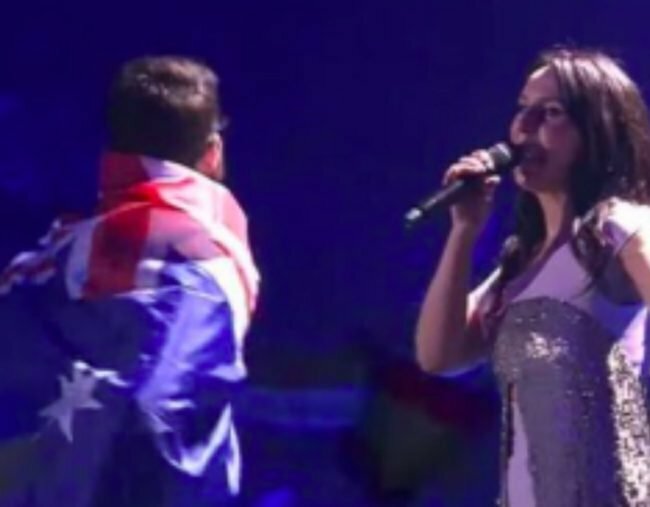 A Ukrainian media personality notorious for ambushing celebrities like Kim Kardashian has streaked at the 2017 Eurovision Song Contest in Ukraine while wearing an Australian flag. With Isaiah Firebrace coming in 9th place, and Portugal taking the Eurovision crown, it is possible Australia will be better remembered this year for the presence of its national flag on the back of a naked man. During reigning winner Jamala’s performance, a man draped in an Australian flag invaded the stage and pulled down his pants to expose his bottom on live TV. It was initially thought the streaker was an Australian but it was later confirmed the man was Vitalii Sediuk, a self-described prankster known for accosting celebrities on red carpets. He has a long list of celebrity victims including Kim Kardashian, Brad Pitt, Leonardo DiCaprio, Will Smith and supermodel Gigi Hadid. At the 2013 Grammy Awards, Sekuik stormed the stage and accepted an award on Adele’s behalf. Sekuik was promptly removed from the Eurovision stage by security and the show’s three presenters made no mention of the incident. But it did not go unnoticed on Twitter, where viewers praised it as the best part of the show.